Ratchet back in time to the summer of 1938 and be in Rockaway Beach at the corner of 110th Street and the Boardwalk. It is late afternoon and most of the serious sunbathers were lugging their beach umbrellas, blankets and ice chests across the still-hot sand to get back to their summer bungalow on one of the side streets that dead-ended along the many miles of the Boardwalk at the ocean front. About 6:00 PM even before the Beach was empty, the ball players were arriving. They are equipped with softball bats and a hard solid rubber ball, the kind Woolworth’s 5&10 sold to dog owners to use to play “fetch.” As the Beach emptied, the four bases and pitcher’s mound were put in place at regulation softball game distances. They were simply small pillow cases filled with sand. Choosing up sides was quickly accomplished since the game was an every-night affair and who played where was an automatic. Since some of the players had been turning out for the game for as many years as their family had been vacationing at the beach, in some cases for thirty years or more. After the regulars had filled all the positions on both teams, there were occasionaly vacancies that had to be filled. Onlooker-fans were always hanging around hoping to get to play ball that evening. 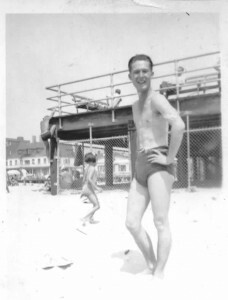 John Donahue, a ruddy-faced Irishman father of five girls and long-time Rockaway vacationer staying at a small bungalow in Mae Court at 109th Street and his summertime neighbor, Eddie McGowan, who lived next door were usually the first to be called since they had been playing dogball for at least 30 years. Now about 70 years old, they began competing on ball fields in a baseball league for teenagers sponsored by the Knights of Columbus. Since they could no longer run to first base in the sand after batting, that led to the creation of some local rules. For one, those players who could still swing a bat but were no longer able to run in the sand could call upon any onlooker to be a one-time substitute runner. This was a slow-pitch game and balls and strikes were not called. A batter could choose his pitch and was allowed one strike or two foul balls and he was out. Playing the sandy infield was a real challenge to the players’ fielding ability. A hot ground ball would take an erratic hop or two and die while a slow-moving base runner made his way. On the nights when the tide was high, the left and center fielders would have to back up to the shoreline. Those dogballs flew when the batter really connected with his softball bat. The game would continue until the street lights on the boardwalk went on. Then they’d finish the inning. More to come as Robert Moses takes time out from his many duties to see that his park police arrested all of the players and brought them to night court. The judge was sympathetic, feeling that no real crime had been committed. However, the die was cast and every night Mr. Moses henchmen in the person of the Park Police regularly toured the beach and hassled the ballplayers. No ball playing on the beach. Since no one wanted to get arrested for playing ball, the game was over… and John Donahue and Eddie McGowan retired to Fitzgerald’s bar on 108th Street. The lights were on and the game was over. This entry was posted in Uncategorized on April 19, 2007 by will.